The main attraction has to be Sensoji. This is a widely used word for an entire complex that stretches from Kaminarimon all the way to several temples and shrines located at the end of the Nakamise Shopping Arcade. Just before you enter, next to the gate at the end of the shopping arcade, there is the Denpoin temple. It doesn’t look very interesting, but from some reports, there is a nice garden located within that temple’s grounds. It is now closed to the public. The first thing you will notice is the grand roof of Sensoji. It towers above the building itself, but it’s someone hidden by two rows of smaller buildings; these buildings, just before Sensoji itself, is where you can buy various charms and fortunes. This temple is one of the few where you can buy fortunes that also come in English and a few other languages. 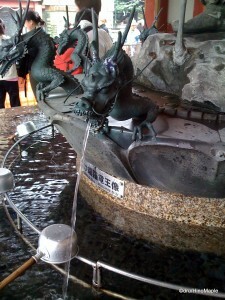 The temple also has one of the most beautiful purification fountains in Tokyo with a very intricately designed dragon. When inside the temple, you’ll be able to purchase more charms, make donations, and pray. Immediately next to Sensoji is the Asakusa Shrine. This shrine is very popular as they have the sanja festival. It’s one of the great festivals of Tokyo and well worth a look if you have a chance. Among the other things to do in Asakusa is to head to the Sumida River. This river is one of the most famous in Tokyo. Near the station, you can enjoy a view of Asahi Brewery’s headquarters. It’s very distinct building is designed to look like a tall glass of beer, while just below it is the Asahi Super Dry Hall. 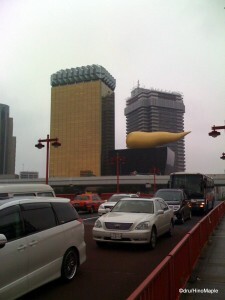 Atop the black box hall is a golden flame, which in reality looks like a big lump of poo. From here, you can head down to a small pedestrian path/park along the Sumida River. It’s popular for runners, as well as homeless people. Located within the same general area is the Tokyo Cruise terminal. From here, you can catch a river boat that takes you along the Sumida River out towards Odaiba. From what I’ve heard, this is a very beautiful cruise and worth the costs. Do be aware that the boats run every 30 minutes to an hour. If cruising isn’t your thing, you can also head over to the department store, Matsuya. If you are looking for a little fun, there is a small amusement park located behind Sensoji. This also provides good access to Kappabashi Street. This street is famous for selling restaurant related goods. You can get everything you need to open your own restaurant, but the main focus is on knives. Many people come here to buy top quality Japanese knives. While you can buy them at various department stores, this is the heart where you can get everything. Overall, Asakusa is an essential place to visit when coming to Tokyo. You will see one of the most famous temples in Tokyo, be able to get all of your souvenirs in one place, and experience a rickshaw tour. There are also several ways out of Asakusa, so you can enjoy a nice cruise on the river, or even get out of the city and head to Nikko for a temple getaway. 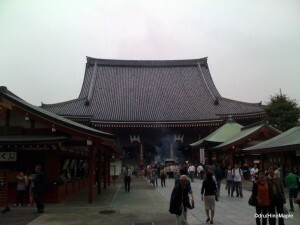 Asakusa is also very important as a place for budget travellers. This is where most of the youth hostels and Japanese style inns are located. While it’s not the most centrally located area of Tokyo, it can be the cheapest. While the accommodations can be cheap, do be aware that you may end up spending more money on transportation to go places, especially if you are trying to make use of your JR Pass. Asakusa is only serviced by the subways and private companies, so the JR Pass is almost useless here. However, it’s still a very fun place. This is Part II of a II part series. For more information on Asakusa, please read Part I. This entry was posted in Tokyo and tagged Asakusa, Asakusa Shrine, Denpoin Temple, Japanese knives, JR Pass, Kappabashi, Nakamise, Nakamise Shopping Arcade, Nikko, Odaiba, Sensoji, shopping arcade, Sumida, Sumida River, Sumidagawa, tokyo, Tokyo Cruise, Tokyo Cruise Terminal, Tokyo-to, 台東区, 東京都, 河童橋, 浅草, 浅草寺, 隅田川 by Dru. Bookmark the permalink.